Henry proves that names can be both the height of tradition and the definition of stylish at the same time. Our Baby Name of the Day comes from this list of classic boy names. It’s the given name of fictional action hero-archeologist Indiana Jones. England’s Prince Harry was baptized Henry, too, with a mouthful of middles. (Charles Albert David, if you’re curious.) British royals have used the name steadily over the years, though last reigning Henry is remembered most for his many wives. Factor in plenty of other European monarchs, as well as a few saints, and this name appears regularly in the history books. Fictional characters galore, including the first name of Dr. Jekyll and My Fair Lady’s Dr. Higgins. Keep digging, and you’ll discover a pirate, a member of the Thomas the Tank Engine universe, a folk hero, an animated monster, and dozens upon dozens more. Like many a Germanic name, this one came to England with the Norman invaders. For many years, Harry served as the preferred form in everyday life, even as Latin preserved the name as Henricus. Data suggests that it would have been one of the most popular names in the English-speaking world throughout the Middle Ages. Surnames from Hendrix to Harrison also come from the many forms of the name as it traveled across Europe. The Germanic original looked more like Heimrich, derived from the elements heim – home – and ric – ruler. It eventually became Heinrich. Other international forms include the French Henri, Italian Enrico, and Spanish Enrique. Celebrities from Julia Roberts to Heidi Klum to Emily Deschanel have given the name to their sons over the last dozen years or so. It’s climbed from #126 in 2000 to #22 in 2016. That often signals a trendy name – the next Aiden or Jackson. Except nothing could be further from the case. Henry has appeared in the US Top 150 consistently since the data was collected way back in the 1880s. Even if it hasn’t always been favored by parents, it would be tough to call this name anything other than classic. Today, given the name’s quick rise along with its status as a go-to for many stylish families, it’s that rare name that feels both timeless and very of the moment. What sparked the name’s revival? With so many famous figures, it’s tough to pin down the reason this name reversed course. But reverse course it did. A Top Ten pick in the late nineteenth and early twentieth centuries, the name left the Top 100 after the 1960s, and reached an all-time low in the 1970s and early 80s. Prince Harry gave the name a bump – even in the US – following his 1984 birth. Kenneth Branagh’s Oscar-nominated 1989 adaptation of Henry V seems to have helped, too. But here’s my best guess: the name had simply hibernated long enough to feel fresh again. If you already knew boys called Andrew and Nicholas, Matthew and Daniel, Henry presented a traditional-but-different alternative. Nickname Hank feels like a friend for Max and Gus, and a few daring parents have even used Huck as an alternative short form. This name’s considerable popularity presents the only real drawback. 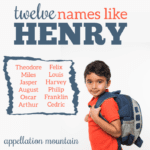 Henry feels smart and cool, a name that works for a small boy or a grown man of accomplishment. You can’t pin it to a specific era, but you’re not surprised to hear it on a boy born today. If you don’t mind the possibility that your son will have to share his name with others, Henry feels like an unassailable classic with a serious cool factor. Readers, would you consider this name? Or is it just too popular to make your shortlist? Note: First published on May 22, 2008 and this post was revised and republished on December 3, 2012 and again on September 20, 2017. Love it, such rich history and some memorable characters from literature! FYI, my maiden name is a form of Henry. If by some lucky happenstance we have another son, I’m still partial to Henry, but due to it’s rising popularity I might jump straight up to Harry. I have to second… Henry just doesn’t appeal to me much. However, the only male figure my OH had as a kid was his Grandpoppa Henry Graham. So I stick Henry in the middle to make him happy (Cosmo Henry). I know this is completely heretical in the name nerd community, but I absolutely cannot stand the name Henry. Something about it gets under my skin. I know of eight Henrys born recently, six of whom have a parent who is a librarian or who spent some time working in libraries. I know one other Henry whose mother is also a librarian, but he’s much older so he falls outside the newfound popularity. There’s also a Henry on the TV show Once Upon a Time who’d be about 11 years old now, making it easier to see the name on a kid. For those of us who don’t already know young Henrys. I named my son Henry Everett John 12 years ago, before the boom. At the time I was looking for something like William, but the play grounds were full of little Wills. So Henry it was. I’m a bit irked that it has become so popular, but I love it none the less. I simply adore Henry and agree entirely with the above comment about it being ‘geek chic’. it is my hypothetic second boys name too! However, Henry has never really gone out of fashion the way it has lattely in the States but always lurked somewhere towards the bottom end of our top 50 – still love love love it though! I love Hugo, too, but it’s a family name on my BiL’s side, so I’ve agreed to keep my mitts off that name. Hector, hmmm … that’s a thought. […] quite fair to say that names failing to make this list aren’t classics. […] DIY’d, the kids have such great names. […] public eye, and would also change our ideas about the meaning. […] has more history than most. 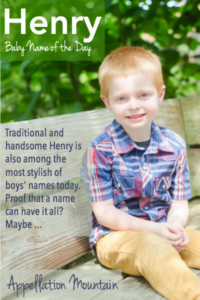 […] Henry and Hudson are both popular picks for boys. […] Deschanel welcomed a son, Henry. […] gypsy, but by the nineteenth century it applied to the artists in Paris’ Latin Quarter. […] like Cannon and Gunner. […] likely to see the names used interchangeably. […] new husband just days after the wedding. […] Bynes played Daphne, an American who heads to London to meet her long-lost father, the aristocratic Henry Dashwood, played by Colin Firth. 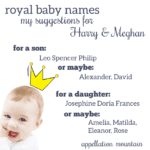 […] changing attitudes towards naming a son. […] the real story of Annora’s endurance has to do with the Pierrepont family. […] My Fair Lady opens, Professor Henry Higgins is bragging that he can teach any person to speak the most elegant English. […] various forms, Humphrey had a good run in Medieval England. […] – Despite the -ana ending, intrepid explorer Henry Walton Jones makes this one slightly more masculine. […] was born in 1822. […] cred: Elvis Costello and Diana Krall used it for a son, Frank Harlan James, twin brother to Dexter Henry Lorcan. […] big fans of Henry, a Name of the Day back in May. […] written about Henry before. […] all very excited about the new Indiana Jones flick, don’t you know?